– oh yes it did! 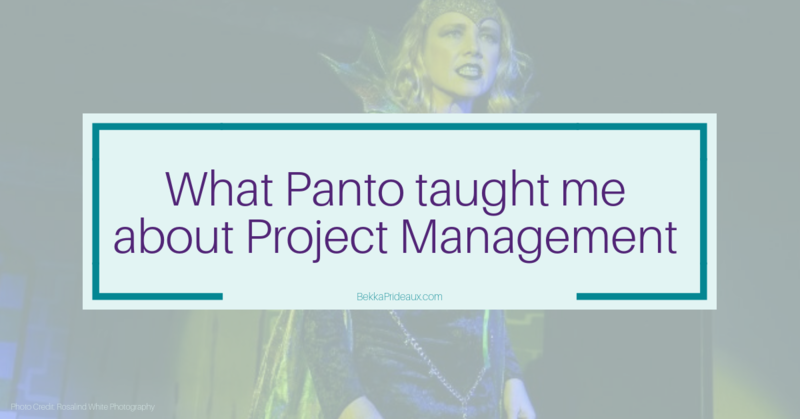 ​Pantomime divas, dames and villains may be more flamboyant than anyone you meet in your usual working life, but the challenges they present can be remarkably similar, which is how my forays into amateur dramatics taught me some key lessons in project management. The British pantomime tradition is something of a rite of passage for audience members, creative teams and the performers themselves. I expected many things when I agreed to direct the village panto a few years ago, but I did not expect to learn some key lessons in project management. When you embark on your project/panto quest, knowing why you are doing it makes every other decision easier. For us, panto was all about bringing the community together, fostering a love of theatre and developing people’s skills. Taking time to agree on that before we did anything else allowed us to speed up many decisions and ensure the way we worked together supported our goals. For example, it led us to change the audition process from the traditional ‘contest’ to one where future cast members showed us their full performance potential, safe in the knowledge that we would find a great part for them. Panto is known for its larger-than-life characters and sometimes it feels the same is true of projects. I’m sure I’m not the only one who can think of a few workplace divas and villains! But it is not just the main players who keep the show on the road. It was only the second performance of the first panto I directed when I learned that one of the key lessons in project management is the importance of building a strong team beyond just the main players. One of the leading actors failed to show up on stage when they should have done, leaving three young and inexperienced cast members stranded mid-scene. It was a joy to see the whole team come together to keep the show going so the audience didn’t notice. It turned out that the missing cast member was looking for a prop that one of the backstage team had helpfully moved to the side of the stage so it was handy for them. Another lesson learned; even teams with the best intentions and a shared vision need to remember to communicate effectively. When planning a pantomime, different teams come up with lots of plans. The set builder may want to design a set before you have even decided what show you’re doing; the choreographer may demand more dance rehearsal hours than there are rehearsal hours in total; the costume team may want to save time by deciding who plays which role based on the costumes that fit, and so on. While project teams in workplaces are used to sharing the plan and working with its interdependencies, this was not a way many of our panto team had ever worked before and this director learned another key lesson in project management the hard (and stressful) way; the importance of reminding people frequently and clearly how what they do fits in with everyone else. Not to mention how changing their plan (once they had one – but that’s another story) impacted everyone else, so communication was critical. Act 2, Scene 1: Would you believe? A panto story is full of twists and turns – and I don’t just mean the scripted ones! Just like the risks on a project, thinking through what could go wrong and having a risk management plan for the more likely and higher impact ones is vital. Working with an inexperienced team showed me how important it is not to make assumptions when you’re thinking about possible risks. What was obvious to me was not always obvious to them. Asking them what they thought could go wrong was not only a great team-building exercise but allowed us to plan for every eventuality and build the team’s confidence. I am glad we never had to implement our plan for the curtain not opening – but I must say, however, that I am very pleased we’d planned what to do if an audience member fell ill. I loved working with our panto team and bringing the complex needs of all the different stakeholders together. Their agendas differed widely, from parents managing their children’s needs and very busy diary, to raffle ticket sellers striving to make lots of money for the village, to the cast and crew who simply wanted to put on a great show and have fun. A key lesson in project management was remembering how important it is to keep everyone engaged and how different things mattered to each group. Managing their different priorities certainly sharpened my negotiating skills. However, the final lesson came after the end of the production. The village hall committee decided they needed to make more money – and that they could do that by bringing in a professional panto team who would pay them for the use of the hall. This decision, made without consultation and while our panto representative was on holiday, brought down our final curtain and, as well as reminding me how to disband a team with dignity, taught me a lesson in keeping project goals and business goals aligned. Behind the scenes, someone is learning some key lessons in project management! While for now my pantomime days are behind me, the lessons I learned are still benefiting me and the projects I am involved with. Underpinning the work I do on project initiations is remembering that investing the time and effort to set things up right at the start of the project accelerates overall progress and reduces the challenges you face along the way.